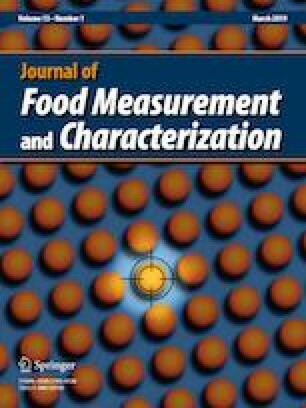 In this study, deep learning method coupled with near-infrared (NIR) hyperspectral imaging (HSI) technique was used for nondestructively determining total viable count (TVC) of peeled Pacific white shrimp. Firstly, stacked auto-encoders (SAE) was conducted as a big data analytical method to extract 20 deep hyperspectral features from NIR hyperspectral image (900–1700 nm) of peeled shrimp stored at 4 °C, and the extracted features were used to predict TVC by fully-connected neural network (FNN). The SAE–FNN method obtained high prediction accuracy for determining TVC, with R P 2 = 0.927. Additionally, TVC spatial distribution of peeled shrimp during storage could be visualized via applying the established SAE–FNN model. The results demonstrate that SAE–FNN combined with HSI technique has a potential for non-destructive prediction of TVC in peeled shrimp, which supply a novel method for the hygienic quality and safety inspections of shrimp product. This research was funded by Ningbo Science and Technology Special Project of China, Grant Number (2017C110002); Natural Science Foundation of China, Grant Number (31201446); Zhejiang Provincial Natural Science Foundation of China, under the following Grant Numbers (LY17C190008, LY16F030012 and LY15F030016); Ningbo Science Foundation of China, Grant Number (2017A610118).